We're very excited to officially welcome the KDE Community on to Matrix as they announce that KDE Community is officially adopting Matrix as a chat platform, and kde.org now has an official Matrix homeserver! You can see the full announcement and explanation over at https://dot.kde.org/2019/02/20/kde-adding-matrix-its-im-framework. It is fantastic to see one of the largest Free Software communities out there proactively adopting Matrix as an open protocol, open network and FOSS project, rather than drifting into a proprietary centralised chat system. It's also really fun to see Riot 1.0 finally holding its own as a chat app against the proprietary alternatives! 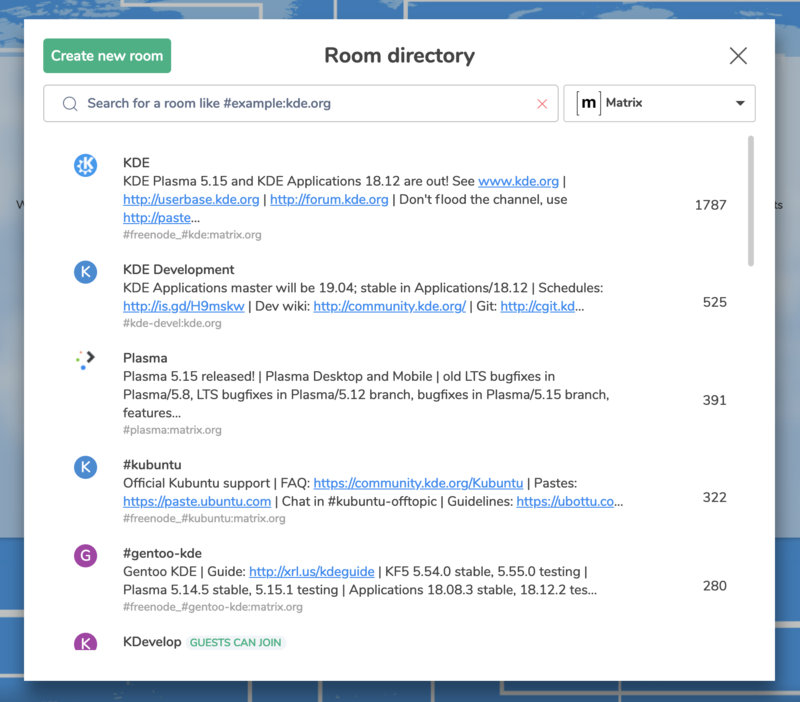 This doesn't change the KDE rooms which exist in Matrix today or indeed the KDE Freenode IRC channels - so many of the KDE community were already using Matrix, all the rooms already exist and are already bridged to the right places. All it means is that there's now a shiny new homeserver (powered by Modular.im) on which KDE folk are welcome to grab an account if they want, rather than sharing the rather overloaded public matrix.org homeserver. The rooms have been set up on the server to match their equivalent IRC channels - for instance, #kde:kde.org is the same as #kde on Freenode; #kde-devel:kde.org is the same as #kde-devel etc. The rooms continue to retain their other aliases (#kde:matrix.org, #freenode_#kde:matrix.org etc) as before. There's also a dedicated Riot/Web install up at https://webchat.kde.org, and instructions on connecting via other Matrix clients up at https://community.kde.org/Matrix. This is great news for the Matrix ecosystem in general - and should be particularly welcome for Qt client projects like Quaternion, Spectral and Nheko-Reborn, who may feel a certain affinity to KDE! © 2019 Matrix.org. All rights reserved.